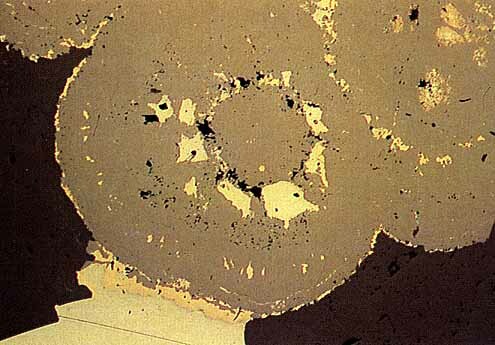 Reniform sphalerite (light grey, centre) is interbanded with galena (white, centre bottom) and chalcopyrite (yellow) in successive growth rings. Chalcopyrite in the centre of the right sphalerite has replaced poorly crystalline pyrite (white, top right). Chatcopyrite can be seen to have higher relief than galena (bottom left). The gangue (dark grey) is sulphate. Black areas are polishing pits.